This is a UK based company established in 2005 by a family with almost 80 years experience in developing and manufacturing children’s safety products. 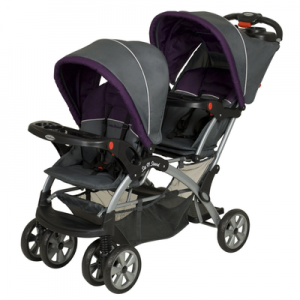 iCandy specialize in designing and making visually stunning, high quality strollers. 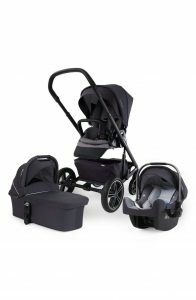 The company started selling their stroller in the U.S. and Canada in 2009 and has received numerous awards The iCandy Peach stroller (iCandy Peach pram in the UK) has earned the “Best Stroller 2011″ from Babble.com in the U.S.
iCandy has never had any product recalls. 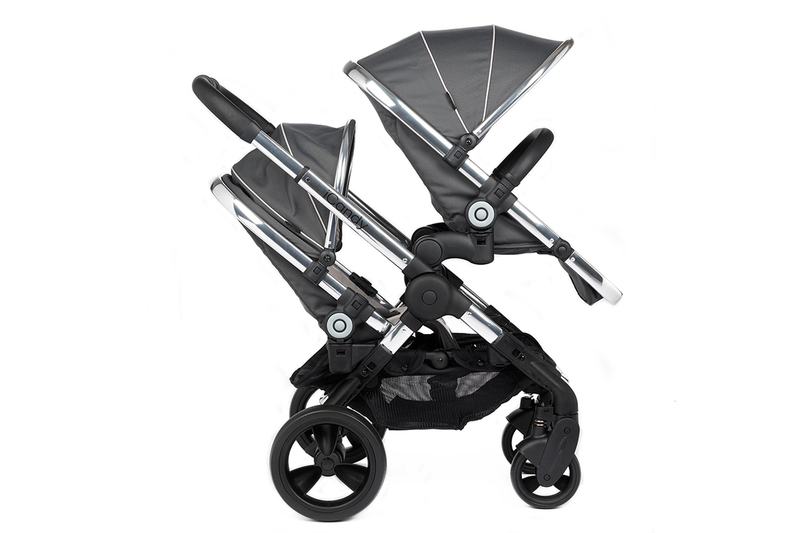 This site will provide you with detailed iCandy stroller reviews. Like the other strollers produced by iCandy, the Peach has a rear facing seat option which promotes parent-child interaction which is recognized as a useful tool in the development of good speech. The reclining, four-position seat also has a forward-facing option for toddlers more eager to experience the outside world. Additionally, the Peach stroller features a flat-lying bassinet. This is good for lung and spinal development. iCandy promotes the use of a flat-lying bassinet for the first six months of a child’s life for optimal health benefits. Footmuff is well made but it is a little too short and does not cover the upper body like some other footmuffs do. The iCandy stroller Peach is a modern, sleek stroller with lots of features. 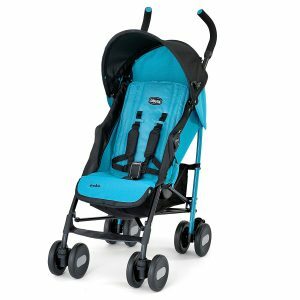 Using great fabrics and colors, this stroller stands out amongst others. 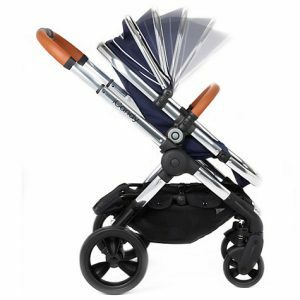 If you intend to buy iCandy Peach Strollers then please read on for more detailed reviews. 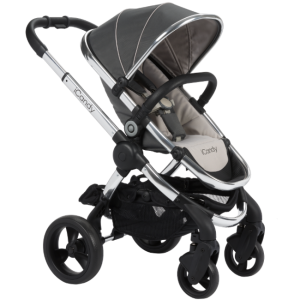 The Peach stroller is extremely easy to push and seems to just glide over paved surfaces. Even with one hand, pushing and steering is easy. 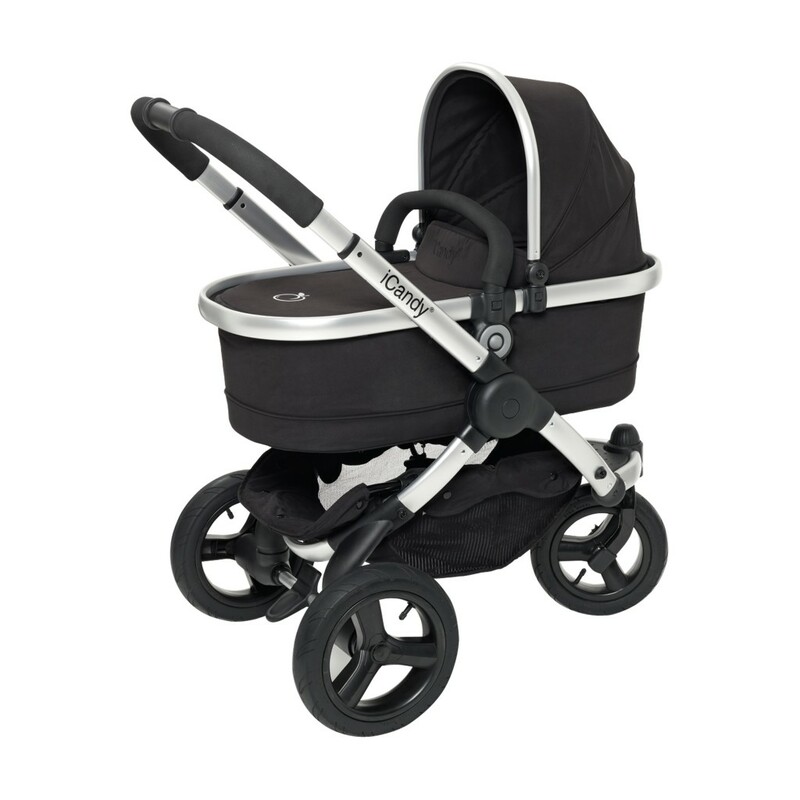 The front wheels are superbly designed and when you move from the pavement to cross a road, if the front wheels touch the road first, they stay stable and do not rotate like other strollers. 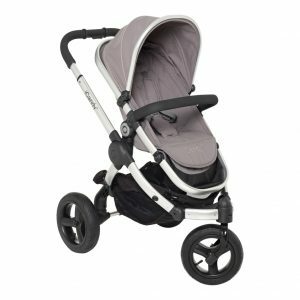 The Peach stroller turns on a dime and will easily turn around on a garden footpath. One handed operation over grass is easy and practical. The frame is very well engineered and constructed of polished aluminum. It is sturdy and feels indestructible. The narrow width allows it to fit through quite narrow shopping isles. 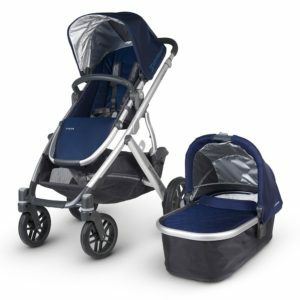 The seat on the iCandy stroller is both front and rear facing and you can adjust it to four different positions to ensure your child remains comfortable. It has a five point safety harness. With the additional adapter for a younger baby (iCandy Peach Blossom) it is easy to attach a bassinet by simply clicking it into place without waking your baby. The seats are available in a variety of vibrant, eye-catching colors and the fabrics are all machine washable. The seat has a bumper bar to help protect your baby. The seat footrest is adjustable. 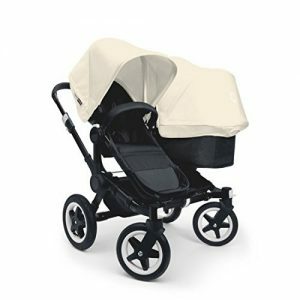 I loved the ease of folding in this stroller. The seat does have to be removed first but this is a simple process. What I really love (and this should be the same for all strollers) is that it can be folded with one hand. Once you have removed the seat unit by pushing in buttons on either side of seat and lifting, all you have to do is pump the handle down which collapses the handlebar then pull the strap that sits in the basket. The base folds in half and you can put the strap over your shoulder for carriage. The frame is free standing when folded. When folded, the Peach takes up remarkably little room and will fit in virtually any small car trunk. In really tight spots, the wheels can easily be removed to save space. To adjust the height of the handlebar, you have to press a large button on the center of the handle and then move the handle to the required height. This is a really simple operation. There are two large wheels at the rear and two smaller wheels at the front (one wheel for the Peach Jogger). The wheels are solid and therefore you will never have to worry about getting a puncture similar to the Stokke Stroller and Uppababy Vista). This makes the ride comfort slightly harder but it is barely noticeable. Brakes are operated by a foot pedal. The foot pedal is easy to press down to apply the brakes but you will probably end up scuffing your shoes trying to flip it up again when releasing the brake. I prefer hand operated brakes. There is a very large cargo area under the seat and this is easy to access. There is enough space for a moderate amount of shopping, a diaper bag and a coat. 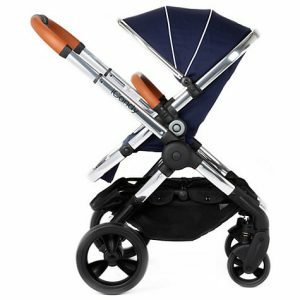 The i Candy Peach stroller is a remarkable piece of engineering. 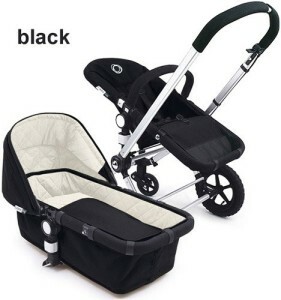 The designers have put a lot of thought into this stroller and not only does it do everything that it is supposed to do but it also looks good too. The colors are vivid and the fabrics are easily cleaned. I love the one handed folding even though the seat needs to be removed first. The stroller folds into an amazingly small space (even smaller if the wheels are removed). Anyone buying iCandy Strollers will not be disappointed but the i candy stroller comes at a price. It is not cheap but this is reflected in the quality.